Try this recipe for a different option to your usual tomato based pasta sauces. 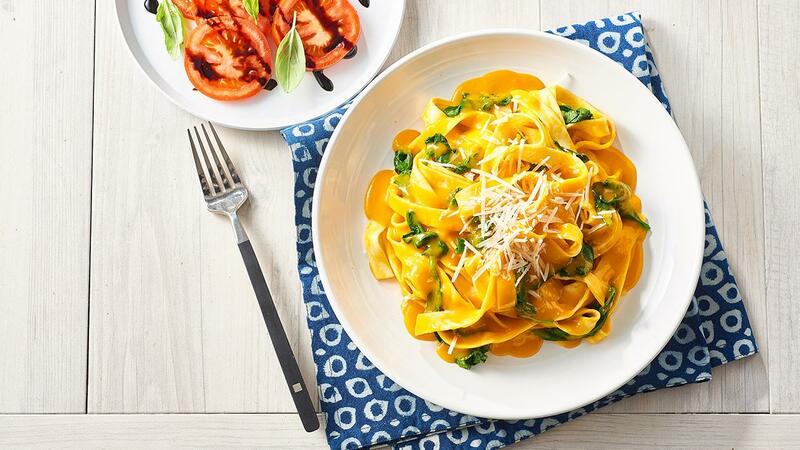 The creamy pumpkin is perfect with egg pasta and sprinkled with fresh grated parmesan. Heat oil in a large saucepan. Add KNORR Professional Garlic Puree, lightly cook then add water and CONTINENTAL Professional Gluten Free Cream of Pumpkin Soup Mix. Simmer for 5 minutes, stirring continuously. Keep warm. Cook pasta until al dente in boiling salted water. Drain then toss through baby spinach to wilt. Add pumpkin sauce to pasta and toss to combine. Serve pasta garnished with parmesan. For a different flavour combination add some sage which matches perfectly with pumpkin.